Deputy Executive Director of the UN Entity for Gender Equality and the Empowerment of Women (UN-Women) Lakshmi Puri. 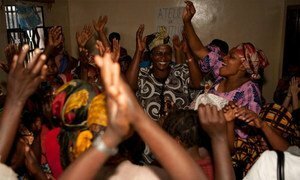 Despite significant progress in meeting international development goals for women’s empowerment, gaps in key areas remain, which require a renewed effort from all partners to better integrate gender issues into the overall quest for sustainable development, a United Nations gender equality official said today. “It is … essential to harness the synergies between gender equality, women’s rights and empowerment with sustainable development in its three dimensions – economic, social, and environmental,” Lakshmi Puri, Deputy Executive Director of the UN Entity for Gender Equality and the Empowerment of Women (UN-Women) said as she opened a high-level forum at UN Headquarters in New York this morning. The two-day event, organized ahead of the fifty-eighth session of the UN Commission of the Status of Women (CSW) next year, is looking at challenges and achievements in meeting the targets for women’s and girls’ progress in the Millennium Development Goals (MDGs), which call for the reduction of extreme poverty and other global ills by the deadline of 2015. MDG number 3 is specifically targeted to gender equality and the empowerment of women, but all eight Goals have been important for that purpose, Ms. Puri said. “We know that the MDGs have played a critical role in galvanizing attention to gender equality and women’s empowerment – not least thanks to the existence of a stand-alone goal on the promotion of gender equality and women’s empowerment – but also to poverty eradication, education, health, water and sanitation, and the environment,” she stated. As a result, there has been what she called “significant progress” in some areas, such as access to primary education and to water. On the other hand, progress is falling short in areas such as maternal mortality, social norms, access to decent work and participation in decision-making. There were also stark gaps within and between countries, she said. Systematic mainstreaming and monitoring of gender equality issues across development goals was therefore needed, she said, noting that women’s empowerment was a precondition for achieving many goals and vice-versa. In regard to the development framework beyond 2015, she called for a new, stand-alone goal with three core concerns: ending violence against women; equal access to resources and opportunities; and equal participation in all sectors of society. The UN Women Stakeholders’ Forum continues today and tomorrow with six interactive panels, the last of which will focus on the post-2015 framework and include the participation of UN Women Executive Director Phumzile Mlambo-Ngcuka. Today is an opportunity for each person to recommit to ending the harm being committed against one out of three women, senior United Nations officials said marking the International Day for the Elimination of Violence against Women.